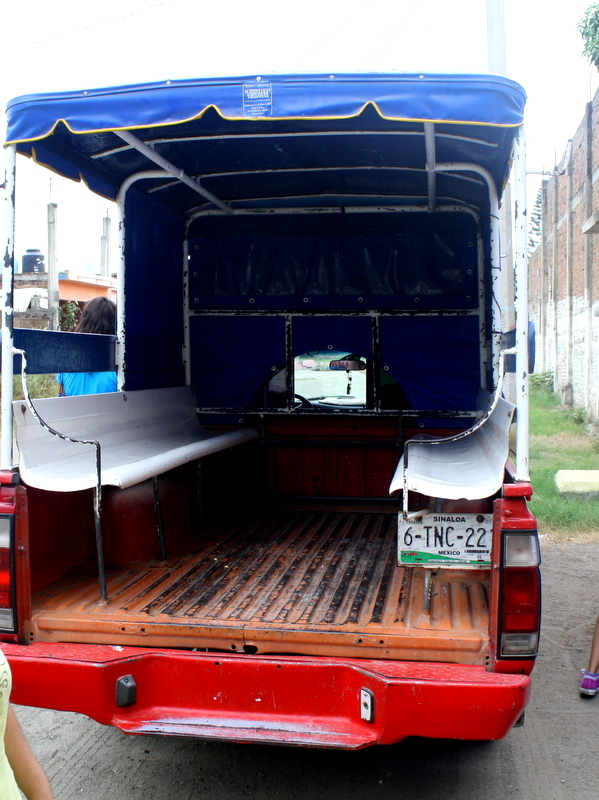 We are riding through the honest streets of Mazatlan in the back of an open-air taxi, which is really a glorified pickup truck with a roofed bench-seat apparatus built into the bed. It is a great place to view the city. We fly through neighborhoods filled with old, crumbling buildings which flaunt the modern times and belie their age with a flash of light from the televisions that chatter inside. Layers of paint peel lazily off these buildings in the bright humidity, adding to the charm of the urban decay. There is a different pace here, something that one notices almost immediately upon arrival, along with the heat and graffiti. Eventually you find yourself succumbing to it, involuntarily. We zoom down one street and up another, and the rain starts. It has been intermittently overcast and sunny all day, sometimes both in the space of a couple of minutes, and I have been hoping for rain. The droplets start to hit the roof and the sun has started to set as the driver turns on Michael Jackson and cranks it and it isn’t long before we are all bobble-heading to the tune. We have just left the orphanage and are headed back to the base. Horns honk in the chaos of traffic, tiny compact cars wedge themselves into traffic in ways that I’ve never seen tried before, and huge buses speed toward pedestrians who saunter casually across the street, seeming not to notice the quickly approaching horrible way to die. Just in time, their feet reach the curb and the bus whizzes past, never slowing. It’s like a cultural game of chicken, happening a thousand times a day, all over the city. People shout to each other from cars. Everywhere, or almost everywhere in this city, if you close your eyes and listen hard, you can hear music. It is part of the fabric of Mexico. One of the layers. There are layers of noise. And the layered visual, wrapping my eyes in a vivid panorama of blunt life no matter where I look. Peeling paint, crooked sidewalks, trash spilling out into the road, cockroaches scurrying, and a flock of beautiful green birds shooting out of a tree like an explosion, in a melee of indignant squawking. Battling smells pile on top on one another and my brain tries to sort out the categories: tortillas, urine, wood smoke, trash, pizza. We go to the orphanage each week, and each time is like another chapter, another piece, another rope thrown across. Derek tells me the paint that they put all over the walls there was quite thin and watery. Many layers were required in order to achieve a solid color. Like ministry. Ministry comes in layers too. And this new way of life. We are in a full state of culture shock, loving this beautiful place but constantly wondering aloud why do they do that? How strange! How odd. How totally inefficient. I am told that culture shock lasts a couple of years usually, before one finally reconciles to the fact that the way something is done isn’t weird or dumb or insane, but only different. And to come here was to peel back a hardened, long oxidized outer layer, the shell of our old way of life. Even if we go back to that way of life, we have seen things we can never forget. Things we never even imagined. We have had new thoughts about the world that we’ll always have now. I can only hope that this will forever change my children’s view. I’ve struggled these last three weeks, dealing with sickness in my whole family, fighting for peace and serenity in the middle of an intense and packed schedule, being misunderstood, and feeling the need for some sort of extra grace or something to get me from one day to the next. I have wondered if we should have come after all. It has been much harder than I ever anticipated. But this is not the spiritual and physical and emotional, and well, human way of things. It’s the way of everything. The taxi speeds through the streets, skidding around a corner, and my heart lurches as I grab for the handle so as not to fall out. At the exact same moment I see the streetlights turn on, and the bright, cheery haze lights up the pavement, and sends a kaleidoscope of cozy warmth down the avenue. The way life is. We grab for a handle, hoping not to fall, and at the same moment some little new grace arrives, lifting us to a higher place. Reminding us that He is good. In all His many layers. Hard is happening, but good too. And I am lately in a state of peeling, finding that there are selfish ways buried down there in my heart of hearts, alongside some very lovely hopes. Back at the base, we decide to go for tacos. I chat lightheartedly with my family and classmates as we walk to the little taco joint on Naked Lady Street, just past the juice stand. Though we don’t always talk about the struggle, I can hear some of it in their comments and see it in the facial expressions. Such a grand adventure we are all on. But also, such a struggle. We find ourselves in His hand, and He alone can make sense of all these layers, homesickness and compassion and discomfort and confusion and hope and help and future and necessities. We are all like onions, being peeled away, one layer at a time, and each morning is ripe with mercy, each evening sings with His faithfulness, and we know, ultimately, beyond all the hazy peripherals and all the shouting priorities, all the clamoring voices, that He waits there, at the center, to keep us in all our ways. We have been here for 50 days. Thank you for the vivid words you choose to express very accurately the city, & your experiences. Your Heavenly Father is holding you close to His heart, he knows you perfectly & understands.